Trainer Dessie Hughes obviously likes the totesport.com Becher Chase. Black Apalachi landed the three and quarter mile handicap over the Grand National fences for the Irish trainer 12 months ago and this year it was Vic Venturi who took the spoils in the £100,000 Listed event. Partnered by Paddy Flood, the nine-year-old was hunted round during the early part of the race as Hello Bud made the running. He began to take much closer order on the long run towards the second last and, approaching the final fence, the race was clearly between Vic Venturi and Keenan’s Future. It was Vic Venturi who handled the conditions best as he powered away up the run-in to register a five-length success. The winner was returned at 7/1. Dessie Hughes said: “I am very pleased. “He had to carry top weight today but he stays very well. “Paddy has given him a brilliant ride and the horse got the trip really well. “He got into a bit of trouble at the third fence but was fine after that. His jumping was very safe. “You would have to say after that race that he would be on target for the Grand National. He could go for the Bobbyjo Chase next and then go over hurdles after Christmas. “With Black Apalachi, we could have two contenders for the National this year. It’s just a pity there will be 38 others runners! 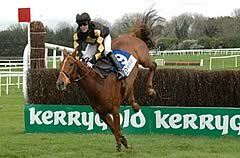 Paddy Flood added: “He is a horse with plenty of class. The main issue before the race was whether he would jump round but he’s taken to these fences like a duck to water. “There wasn’t really much riding involved for me today - I just had to steer and push him along. “There is no other course like this to ride round. When you get a horse in a rhythm over these fences, there is nothing like it. “He will be a National horse - he’s a little bit small but has plenty of class and jumps like a buck. Reaction among bookmakers as to Vic Venturi’s chance in the 2010 John Smith’s Grand National was variable. totesport go 16/1 while Paddy Power offer 20/1. Both Ladbrokes and William Hill offer more generous odds, quoting 25/1 about Vic Venturi for the 2010 Aintree spectacular. Ian Williams, trainer of the toteposrt.com Becher Chase five-length runner-up Keenan’s Future, was delighted with the performance of the eight-year-old. He said: “It was a huge run. He has jumped like a stag and travelled well. “He would not have appreciated the ground as soft as it is. Now it is a question of whether we can get him up high enough in the handicap to get a run in the Grand National. “He would make a lovely National horse. It is a question of whether he is quite good enough. He will go up a few pounds for this run and then we have to get him up another 7lb or 8lb. Whether that is feasible, I don’t know. We will try very hard as he has loved it out there today.